In the Main Menu, click eServices, eConfirmations. eConfirmations are automated text message and/or email reminders about upcoming appointments that also allow the patient to e-confirm. Signup for eConfirmations. Service fees apply. See Signing up for eServices. Create eConfirmation rules. Rules determine when and how an eConfirmation is sent, and the eConfirmation message. Select other eConfirmation settings (confirmation status options, one vs two-click messages, clinic preferences). 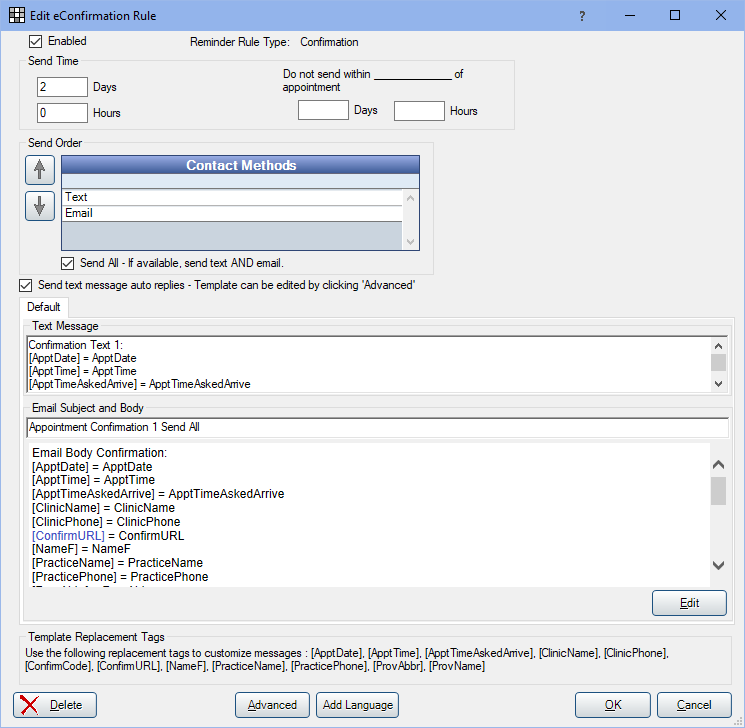 eConfirmation rules determine when eConfirmations are sent, the delivery method, and the message text. You can create an unlimited number of rules. Note: When there are multiple clinics, you can create default rules that are used by all or some clinics, or different rules for each clinic. Automation can also be turned on/off per clinic. Select the clinic and any clinic-specific settings. To create default rules, select Defaults as the clinic, then create the rules. To apply default rules to a clinic, select the clinic, then check Use Defaults. To create clinic-specific rules, select the clinic, uncheck Use Defaults, then create the rules. To turn on/off automation by clinic, select the clinic, then check/uncheck Enable Automation for Clinic. Click Add Confirmation to create a new rule, or double click an existing rule to edit. Enable: By default this is checked, meaning the rule is turned on and active. Uncheck to disable the rule. Send Time: Set time preferences for sending the message. Days / Hours: Set how far in advance of the appointment, in hours or days, the eConfirmation should be sent. Entering 0 for both days and hours will disable the rule without deleting it. Do not send within ____ of appointment: Control whether or not messages are sent for short notice appointments (e.g. same day appointments). When values are entered in the Days / Hours, eConfirmations will not be sent when the upcoming appointment time falls within the time period. If both Days and Hours is blank, messages may be sent up to the appointment time. The automated eServices schedule also affects send time. See eServices Setup Miscellaneous Tab. If a confirmation is scheduled to be sent before the automated start time set on the eServices Setup Miscellaneous tab, the Do not send value is ignored. Patients cannot be sent more than one eConfirmation text in the same day. When a new appointments is created and the send time for some rules have already passed, the rule closest to the appointment date/time will be used. Example: There are two rules: 7 day and 3 day. A new appointment is created 2 days from now. The 3 day rule will be used for the since it is closest. Send Order: Select how eConfirmations will be sent. Check Send All to send via text message and email, if patient has both options. Preferred ConfirmMethod: Use the patient's preferred confirmation method to send the message. If Work Phone is selected the program will move to the next send method (Text or Email). To send text messages, sign up for Integrated Texting. To send emails, set up email. Customize the eConfirmation message for text messages and/or emails. Text Message: The text used for text messages. Email Subject and Body: The subject line and body text used for emails. 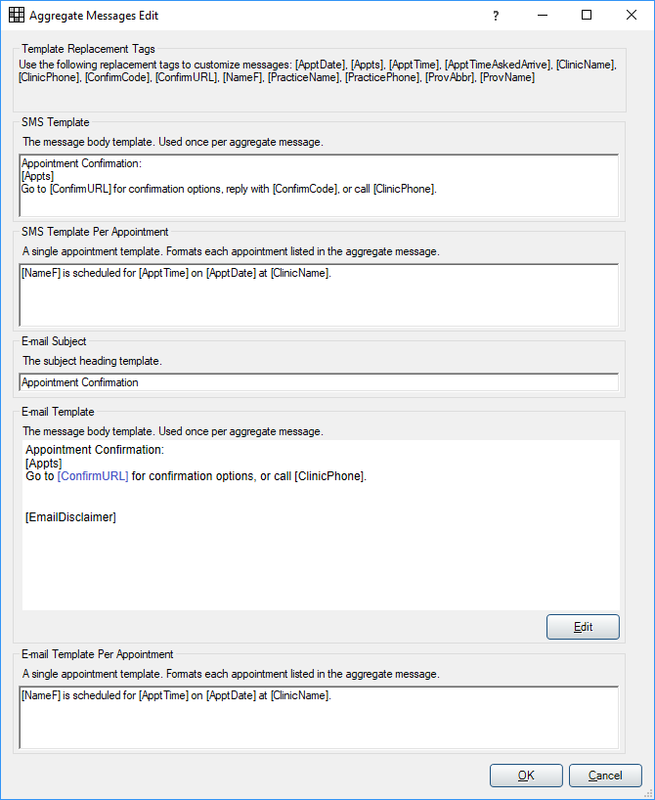 To insert data from the database into the message text, use Template Replacement Tags. [ApptDate]: The date of the appointment. [ApptTime]: The start time of the appointment. [ApptTimeAskedArrive]: The time the patient is asked to arrive. Defaults to the appointment time if TimeAskToArrive is not set. See Time Ask to Arrive. [ClinicName]: The name of the clinic. [ClinicPhone]: The phone number of the clinic. [PracticePhone]: The practice phone number. [ProvAbbr]: The abbreviation for the provider the appointment is scheduled with. [ProvName]: The provider the appointment is scheduled with. [ConfirmCode]: Include the short code C in an integrated text message. Example: Reply [ConfirmCode] to confirm = Reply C to confirm. When patient texts back a C, the appointment confirmation status will change to the Accepted status. [ConfirmURL]: Creates a URL link the patient can click to confirm their appointment or request a call back. We recommend testing the rule and message prior to sending. Make sure you meet character limitations, that replacement tags work, and that the message appears as intended. When one or more appointments on the same day share a common patient email address and/or wireless phone number, the associated eConfirmations will be grouped together into one long text message or email. If a patient responds to the eConfirmation, it will change the confirmation status for all appointments in the message. On the Edit eConfirmation Rule window, click Advanced. Change the text message and email templates as needed. See below for a description of each field. Click OK to save and return to the Edit eConfirmation Rule window. Note: Clicking Cancel to close the window will also close the Edit eConfirmation Rule window without saving any settings. Template Replacement Tags: A list of valid template replacement tags that can be used to insert data from the database into the message. SMS Template: The text and template replacement tags to use for the general aggregated text message. The tag [Appts] will represent each appointment and is required. The tag [ConfirmURL] represents the link to the confirmation URL. Goto [ConfirmURL] for confirmation options, or call [ClinicPhone]. SMS Template per Appointment: The text and template replacement tags to use for each appointment [Appt]. [NameF] is scheduled for [ApptTime] on [ApptDate] at [ClinicName]. Email Subject: The text to use for the subject line of emails. Email Template: The text and template replacement tags to use for the general aggregated email message. The tag [Appts] will represent each appointment and is required. The tag [ConfirmURL] represents the link to the confirmation URL. Email Template Per Appointment: The text and template replacement tags to use for each appointment [Appt]. Ann is scheduled for 3:45 pm on 3/24/2018 at North Clinic. Jerry is scheduled for 4:45 pm on 3/24/2018 at North Clinic. Goto http://od.ag/c/HQpxDyE for confirmation options, or call 555-555-5555. Note: When a patient has multiple appointments on the same day, only their earliest appointment will show in the message. Sent: The status applied when an eConfirmation is sent. Note: If you have set up more than one eConfirmation rule, do not select a default status that is set to exclude when sending for eConfirmations. Accepted: The status applied when a patient confirms the appointment (via the URL link or confirmation code). Not Accepted: The status applied when a patient replies Request Phone Call on the URL link. When a patient requests a call back, an Alert will also notify staff. Failed: The status applied when the eConfirmation fails to send. A list of all confirmed statuses shows in the bottom left. Double click on a status to edit its settings. See Appointment Confirmation Status. Allow eMessages from Appts w/o Clinic: This is a general option that applies to both eReminders and eConfirmations when the clinic on an appointment is set to none. : This is a general option that applies to both eReminders and eConfirmations when the clinic on an appointment is set to none. Checked: eMessages will be sent to all appointments, even if no clinic is assigned. Unchecked: Appointments with no clinic will not be sent a message. 1 click vs 2 click confirmation: These settings determine whether patient will click on the confirmation link once or twice to confirm the appointment. Confirm from link in message (1 click confirmation): When the patient clicks on the link in the eConfirmation message, the appointment will be immediately confirmed. Confirm in portal after clicking link (2-click confirmation): This is the default setting. When patient clicks the link in the eConfirmation message, the confirmation portal will open with a list of choices. Patient can opt to confirm or request a callback. Note: Making changes to this setting will only affect messages sent in the future. Once rules, confirmation status, and automation options are set up correctly, activate the service to begin sending eConfirmations. On the Automated eReminders and eConfirmations tab, click Activate eConfirmations. The button label will toggle to Deactivate eConfirmations. We recommend testing your eConfirmations and/or eReminders using a test patient with your personal email or wireless number. Schedule an appointment the number of days in advance that matches one of your Rules to verify receipt. This can take a few minutes after the scheduled time of the appointment for it to process. If the message fails to send please contact Open Dental Support for assistance troubleshooting. Note: To stop using the eConfirmations eService, click Deactivate eConfirmations, then contact Open Dental support to stop charges on your account. What happens when a patient clicks the eConfirmation URL and selects Request Callback? The appointment status changes to the status selected for Not Accepted and an Alert in Open Dental will notify staff (those subscribed to the Patient Requested Callback alert). Note: The alert created when the patient selects Request Callback cannot be deleted but will go away once the appointment status is changed or marked complete. How do I exclude a patient from eConfirmations? Set the Exclude eConfirms/Reminders setting in the Edit Patient Information. If text or email is selected, the patient will not receive eReminders or eConfirmations via the selected method. Select both to exclude all. How can I prevent an eConfirmation being sent for a specific appointment/patient? In the Confirmation Statuses grid, double click the appointment confirmation status. On the Edit Definition window, check Exclude when sending under eConfirmations. Example: Ignore appointments that are already marked confirmed. By patient as a whole, set the Exclude eConfirms/Reminders setting in the Edit Patient Information. If text or email is selected, the patient will not receive eReminders or eConfirmations via the selected method. Select both to exclude all. How do I stop the system from automatically updating the appointment confirmation status when an eConfirmation is sent? Under Confirmation Statuses, double click the appointment confirmation status. On the Edit Definition window, check Exclude when confirming under eConfirmations.